John Sayles' Philippine-American War Drama "Amigo" is finally in US Theaters : Will this finally put the Philippine American War on America's historical radar? “At the turn of the 19th Century, the United States declared war on Spain. This conflict brought them to another nation, halfway around the world, where they decided to stay. PHILIPPINES 1900″ Thus starts the trailer for John Sayles latest film “Amigo”, a fictionalized account of the true story of the Philippine-American War — a war that we Americans generally don’t know ever happened, which is a shame since it foreshadowed in many ways the Vietnam war that would follow six decades later. Check out the trailer, then scroll down for more links. The short version of the history is this: Goaded by Cuban revolutionaries living in exile in Washington and New York, and enraged by the mysterious explosion that sank the USS Maine in Havana harbor, the United States declared war on spain and took on the Spaniards in their colonies in Carribbean — and in the Philippines, a Spanish colony halfway around the world. Commodore George Dewey and the US Asiatic squadron took on and destroyed the Spanish fleet in the Battle of Manila Bay. 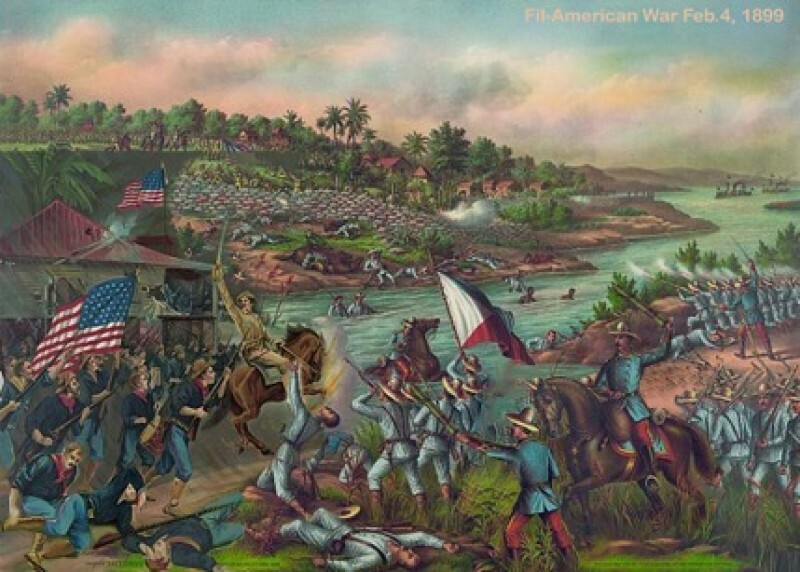 After defeating the Spanish Fleet, Dewey waited months for ground troops to arrive–and largely as a result of the help of Philippine revolutionaries under Emilio Aguinaldo, succeeded in keeping the Spanish bottled up in Manila until reinforcements arrived, after which the Spanish were induced to surrender. At that point, the Filipinos expected to be given their freedom — indeed, in order to get the consensus to declare war, the US had passed the Teller Amendment certifying that the US had no territorial ambitions and would grant freedom to Cuba after liberating that country. But the Philippines, halfway around the world and lacking the lobby that Cuba enjoyed through its population of well-heeled exiles in Washington, was not mentioned in the Teller amendment and it turned out that America had, or developed, other ambitions with regard to the Philippines. 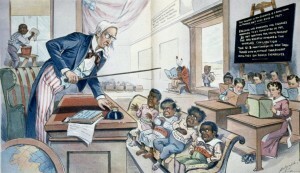 In December 1898, the Treaty of Paris made the Philippines an American colony, and two months later in February war broke out between the Americans and Filipino “insurrectos” under Aguinald, Bonifacio, et al. The war began as a conventional one but quickly evolved into an insurgency with Americans occupying the towns, and the insurrectos playing the role of “Viet Cong”, obtaining covert assistance from the townsfolk while operating from jungle and mountain redoubts. One of the great ironies is that the Philippine insurgents took a great portion of their inspiration from George Washington and that military leader’s guerrilla tactics against the British. 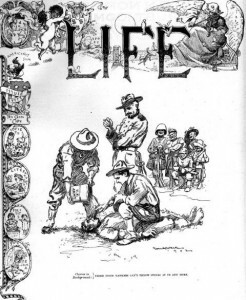 Anyway — my short version is getting long — if you have interest in learning more about this tragic episode in American and Philippine history, here’s an article I wrote previously about it (and a documentary film as well). Also, here is an interview with Bob Couttie about his book Hang the Dogs, the True and Tragic History of the Balangiga Massacre. I decided to write about the Philippine American War because earlier today Rena and I were working on a new chapter of “Daughter of Lawaan” and in that chapter had to deal with the Balangiga Massacre (which Rena’s ancestors participated in — Lawaan was part of the Balangiga poblacion) –and while we were doing that, I found myself thinking once again about Balangiga, which in turn led me to start thinking about the Philippine American War which is one of the topics that most intrigues me (and disturbs me) about the Philippine-American relationship. I began to get that old feeling I always get when I think about that war — that this is an important topic which has never really been adequately resolved either as an item for discussion between Filipinos and Americans, or as an internal American political and historical issue. The undeniable fact is this: it was a violent and tragic war that cost hundreds of thousands of Filipino lives, and ended up costing more American lives than the current Iraq War–this at a time when the American population was 25% of what it is today and when America was a far cry from the “global policeman” that is has evolved into today. It became a hard to cure, open festering sore that created a huge rift in American political discourse and public opinion and damaged America’s sense of who it was. Once you know the story of this war, you can’t contemplate Vietnam or Iraz or Afghanistan without recognizing the Fil-Am war as the relevant antecedent. It’s a story that matters, and isn’t written about often enough. And so I will make a little noise about it — a little bit today, introducing it and scratching the surface, and more in the future because I feel like this is a piece of history that needs more examination, particularly in America, than it has been given to date. And because I’m endlessly fascinated by it. Why Don’t They Teach it in American Schools? The following is a little painful and embarrassing to admit, but it is what it is: Growing up in America during the Vietnam era, I never learned anything whatsoever in school about the Philippine American War even though it was in many ways a prequel to Vietnam (and more recently, Iraq and Afghanistan) — a war that should have been a “teachable moment”, and thus should have been studied widely so as to become embedded in our consciousness as a nation as America’s first foreign “adventure” as a world power, and as a lesson from which to learn certain truths. Yet it just wasn’t there as part of the general curriculum — the story was completely absent from the general American history curriculum that all students were exposed to. I’m sure if I’d been a history major I would have learned about it — but this is not something that should be absent from what every student learns. I am not a conspiracy theorist but the glaring lack of educational emphasis in general American history courses about this conflict always struck me as something approaching a conspiracy, a chapter in American history that official America wants to forget, and is encouraging each new generation of Americans to forget by simply not including it in the curriculum. Why? Isn’t there value to be gained from considering the war? What were American leaders thinking? Why did we do this? What did we learn from it? The rationale given at the time for taking the Philippines as a colony was that the Filipinos “were not ready for self-governance”, and needed to be “educated” by America to prepare them for independence. It ended up being an embarrassing episode in America’s history–one that ran counter to the overall “freedom” narrative that is taught in American schools, and perhaps not coincidentally it vanished from the general curriculum and instead it became a forgotten part of American history that, for whatever reasons, is only studied by diplomats, academicians, journalists, and people who have a connection the Philippines. As the ultimate evidence in support of this, I once saw a Jeopardy show (and they pre-screen the contestants) where not one of three students could get this right: “This former American colony was granted independence in 1947 after 50 years of American rule.” Correct response: “What is the Philippines?” Nobody got it. Having said that — I’ve also been surprised over the years at how relatively little many of my non-academician Pinoy friends know about the war, and how those non-academics who do know a bit about the Fil-Am War seem to generally focus on a) “Dewey lied to Aguinaldo”, b) the Americans used a sneaky ruse to capture Aguinaldo, c) the Americans got their comeuppance at Balangiga. There doesn’t seem to be widespread understanding in the Philippines about how the war divided America and was the subject of a huge amount of debate in the US — with many great Americans (Mark Twain, Andrew Carnegie,e tc) joining the Anti-Imperialist movement that was utterly opposed to the war and to America taking the Philippines as a colony. 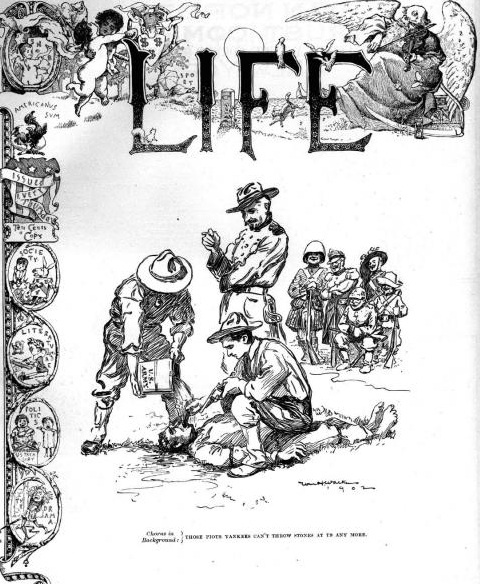 It is a gross oversimplification to believe that the actions of the US government during the immediate aftermath of the Spanish-American War, including its actions against Philippine insurgents–(actions that included what was then called the ‘water cure’, and is now called ‘water boarding’) during the Philippine American War, represented any kind of consensual “will of the people” of America. It was more complicated than that, and many voices were raised against the taking of the Philippines as colony and the conduct of the war.